By spring 2014 this site should see a record crowd for any MLS game ever. Two years later the Super Bowl. But for now it’s a plain construction site as Atlanta’s dream is slowly shaping up. Yesterday evening saw 500 guests celebrate groundbreaking. Falcons and MLS Atlanta owner Arthur Blank, Atlanta Mayor Kasim Reed, NFL commissioner Roger Goodell and MLS commissioner Dan Garber were among those grabbing shovels before fireworks lit the sky and champagne corks popped. But behind the scenes works has actually been going on for weeks. No champagne there (well, we hope! ), but a lot of mud and effort as clearing and excavation works were delivered at parts of the site. No piling begins and foundation works will follow suit. 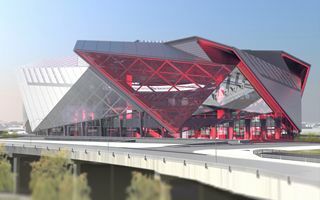 The future stadium lies in central Atlanta, just metres south of Georgia Dome, which will be demolished after construction is done south. The project is considered one of the largest sports stadiums ever. Not in terms of capacity – that will reach 71,000 with potential for several thousand more temporarily. But financially it’s a real monster, one of the world’s most expensive. Interestingly, it wasn’t have a budget this huge. In 2011 it was expected to cost $700 million. In 2012 it was $947m. By 2013 the sum reached $1 billion as the official design was unveiled. And now it’s thought to require $1.2 billion. The price and actual size are generated, among other features, by the unique roof. 8 primary trusses will form a star over the stands, while further 8 retractable panels are to convert the stadium from open-air into a closed dome in minutes. What’s new in this system, is that it will be the first one so big to work like a diaphragm, moving circularly. Under the roof there’s a large, panoramic screen planned, followed by three-tiered stands below. Accommodating 7,500 corporate seats and numerous private suites, the stands will work in two modes. The general one will see 71,000 seats available. Meanwhile for lower scale events (like regular MLS games) two upper balconies will be covered by special curtains, leaving under 30,000 available. The entire area created within the stadium will reach 167,000 sqm, also becoming one of the world’s most impressive. The corporate hospitality alone should cover 13,000 sqm. Both the business clients and regular season ticket holders are already invited to find their spot before opening, planned for March 2017, before the NFL season opens. But while in the NFL this won’t be the largest stadium, in MLS it’s really going to stand out. Even if most games will see upper stands covered, already now Arthur Blank hopes to draw a sell-out 71,000 crowd to the first game, setting a new MLS record. Two years later the stadium is hoped to see its first Super Bowl. This won’t be possible earlier because of NFL regulations that say a stadium must be opened 2 years before the event. Besides, with the new Minnesota stadium being named the host of 2018 game just today, 2019 is the first date available anyway. But before waiting years for the Super Bowl, now Falcons fans will be counting down the days until spring 2017. From today on you can do with us as the progress will be published regularly at StadiumDB!